Killer Characters: What happens when you forget someone's name? What happens when you forget someone's name? 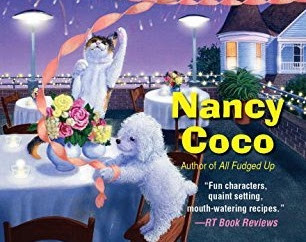 Hi Caramella here from Nancy Coco's Candy-coated mystery series. That's me playing with the streamers and my friend, Mal. In "Oh Say Can You Fudge" I appeared to save Allie and the Historic McMurphy Hotel and Fudge Shop from disasters great and small. But here's the thing, I never got a name. How rude is that? My author says she forgot. Who forgets a name? Apparently she forgets names all the time. Like when she's introducing one old friend to a new friend. She'll forget at least one of their names, if not both. It's a silly human trick. We cats have our own way of identifying ourselves and others. So human meows are of little consequence. Still you would think that, if they went to the trouble of naming each other, the least they could do is remember the names. Just this month my author was running around looking through pages and notes because she didn't remember Liz McElroy's name. Liz is a nice girl who writes for the local newspaper. We had a scene together and poor Liz was called XYZ(look this up). Really XYZ (look this up)? At least my author remembers my name. It seems she ran a Facebook contest and Caramella, Mella for short, won. I don't mind the name as long as they don't confuse me with my friend Marshmallow-Mal for short. But then who would mistake me for a dog anyway? Hmmm. I like Mella. I've been called worse, which is why I ran away from my original owner who shall remain nameless in my world. So I guess I've dropped a hint that I'll be showing up in the next book, "All You Need is Fudge" out next year. Hopefully my author will do better at remembering everyone's name. Do you forget names? If so what was your most embarrassing moment? Curious cats want to know. Leave a comment below. Meows and see you next time kittahs. I have tried to introduce a friend to a large group of people and my mind went blank (on one person). I even knew the person very well (it had been a long day). When I was a young teen, someone introduced me to a boy named Richard. I said, "Hi, Willow." Love, love, love the Bichon!!!! I will never live down the time I turned around and asked my sister what our brother's last name was and she replied, the same as yours. No, I was only in my thirties at the time! I think it's probably so embarrassing that I've blocked it out of my memory. Or I've been embarrassed so many times for the same thing, I'm immune now.